This is an optional RPM Team Durango SC410 Front Bumper & Skid Plate Set. The RPM Front Bumper and Skid Plate for the Durango DESC410 series of trucks adds a level of protection unmatched by any other bumper presently available. The RPM front bumper is wider than the stock bumper, protecting sections of the inner A-arms and hinge pins normally left exposed by the stock bumper. The RPM skid plate design has a shallower approach angle, coupled with three strategically placed skid rails along the front of the skid plate, allowing the front end of the truck to transition up and over impacted objects easily and with the least amount of friction possible. 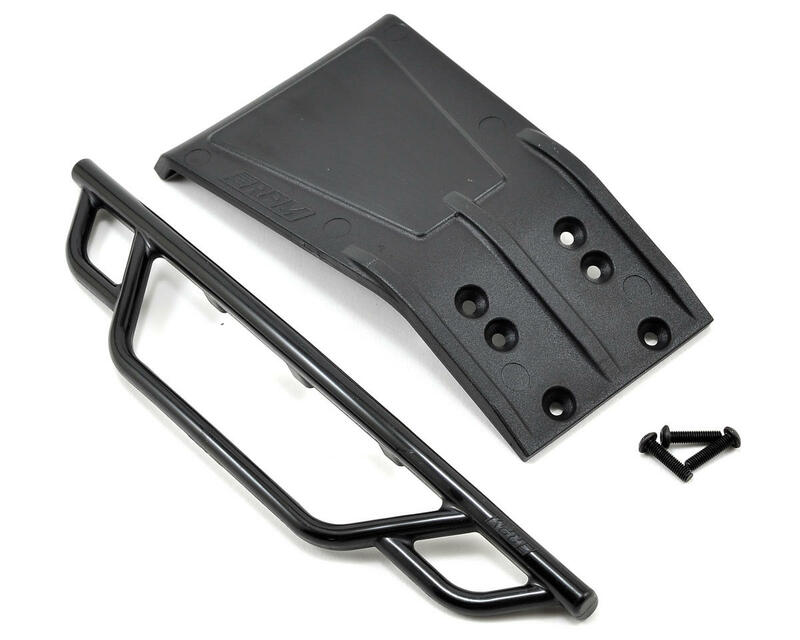 RPM skid plates are 20% thicker than stock as well, yet reduce ground clearance by less than 1mm. 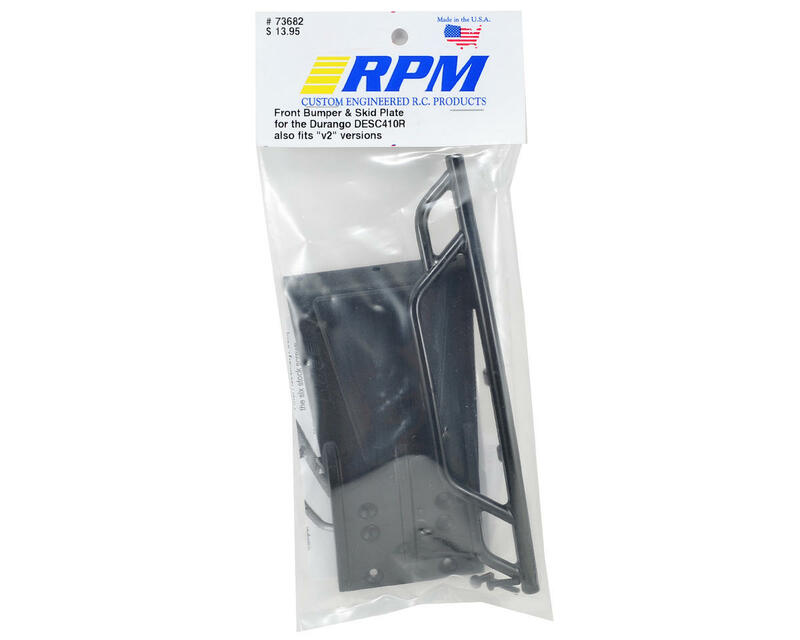 The design of the RPM Front Skid Plate removes the stock bumper support ring from the truck, preventing frontal impacts from transferring impact energy into the front differential housing. This allows much more room for the bumper to absorb impact energy when that inevitable head-on collision occurs. By absorbing the impact, less energy is transferred into the chassis, protecting those more fragile internal components from damage. The RPM front bumper design not only looks awesome, it allows the use of RPM Light Canister sets (RPM #80982 or #80983) for those wanting to run LEDs in their front bumper for unlimited nighttime fun and incredible scale desert truck looks! Combined with a set of RPM 6 Light Roof-Mounted Light Bars (RPM #80922), the fun doesn’t have to stop when the sun sets. The RPM Front Bumper and Skid Plate set for the Durango DESC410 series of trucks is molded from RPM's trademark blend of nylons for incredible durability and unmatched performance. Each package comes complete with all necessary mounting hardware and instructions. Each kit is proudly designed and manufactured in the United States of America.